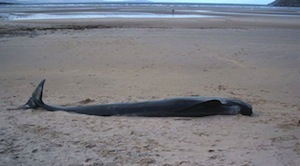 COUNTY council staff are making arrangements to have a dead pilot whale found stranded on a Donegal beach removed. The animal was beached at Fintra earlier this week. The Irish Whale and Dolphin Group says it tries to monitor whale strandings with around one recorded every two days in Ireland every year. Dr Simon Berrow also confirmed that reports had been received of a bottlenose whale on White Strand in Co Clare and a dolphin in Silverstrand, Co Galway – all found dead. The latest find was a male sperm whale stranded on Omey Island in Co Galway, shed of its skin and with a broken lower jaw. “Chances are it died offshore and got washed in with the wind,” said Berrow.